Built in 1935, this Art Deco gas station was designed by R.J. Kadow, and was one of the original service stations for the Gilmore Oil Company. The Gilmore family is a longtime Los Angeles institution, having acquired the Rancho La Brea in the mid 19th century. In the early 20th century, oil discoveries on Gilmore land brought about a new fortune in petroleum. The Gilmore family went on to establish Farmer’s Market (HCM #543), which was built alongside the original Gilmore Adobe. They also established the Gilmore Bank, built Gilmore Field for the Hollywood Stars, a minor league baseball team, and also sponsored midget race cars on a small race track. Both the field and the racetrack were later replaced by CBS Television Central. The Gilmore Station itself remained with the company until its merger with Mobile Oil in the 1940s. 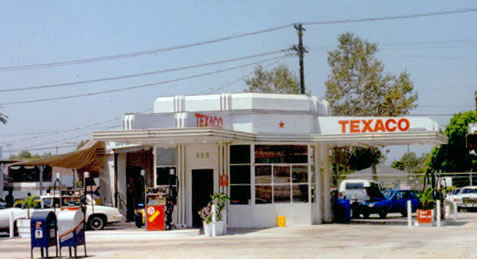 The station was later leased by Texaco, and today serves as a hand-car-wash facility and movie set.